I don’t normally look at my food posts and drool. 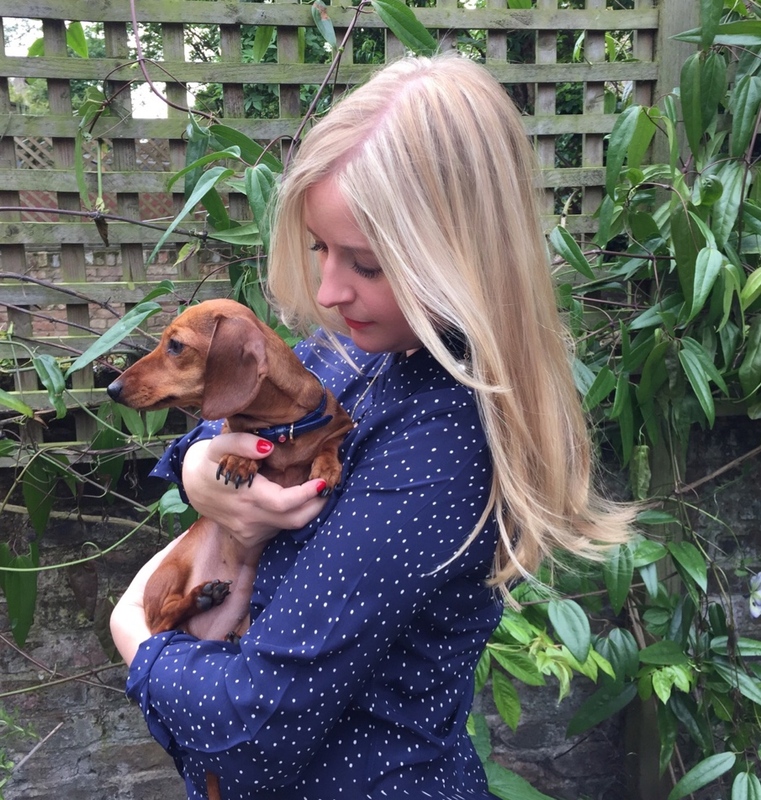 But KERRIST I must really love you all to be writing a recipe, because here I am on day four of a five day raw food regime and frankly there’s little I wouldn’t eat right now. After chewing salads and drinking endless bloody juices, I am craving texture. 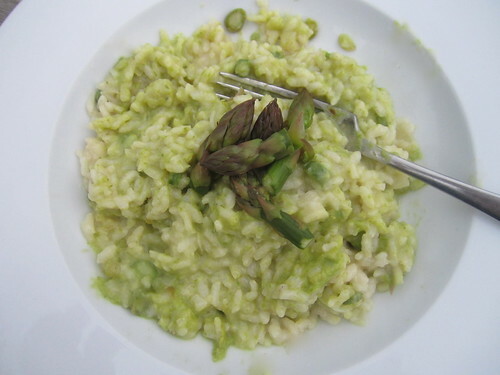 Which leads me nicely to this asparagus risotto. 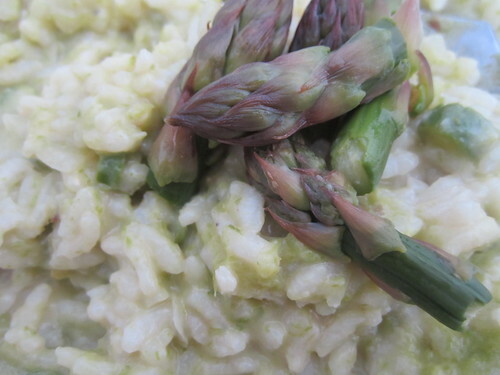 Sure, there’s not a lot new about the rice/asparagus combo, but I zhooshed this one up by making an asparagus & cream puree to stir in at the end to add an extra grassy hit and a pretty pastel green colour. 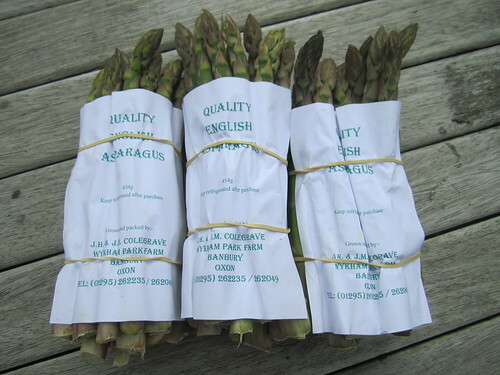 First take your asparagus. This was for two people – well, it was local, in season and it seemed rude not to go LARGE. 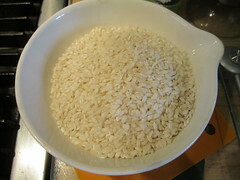 We actually steamed two bundles for a first course, and used the third for the risotto for two. 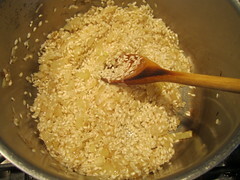 Fill a saucepan with about two cups of water and heat to boiling. Prep asparagus by breaking off the ends where they naturally snap. 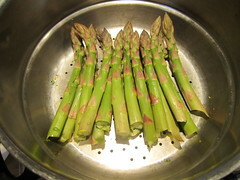 Place the stalks in a steamer, with the ends in the water underneath. 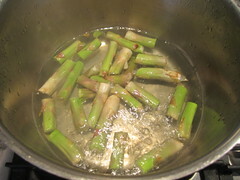 The stalks only take a few minutes once the water is boiling. Leave the ends boiling away. Cut the tips off all the asparagus and reserve. 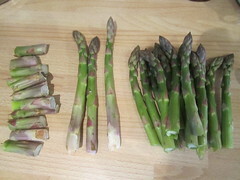 Divide the asparagus stalks in half. Reserve one lot and slice the other into tiny rounds as below. Turn off the boiling asparagus ends, and fish them out. DO NOT THROW AWAY THE WATER. You can use it to make the risotto later. 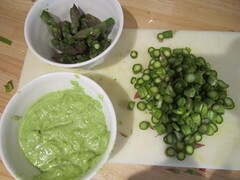 Then take your food processor and add: the asparagus stalks, Maldon salt & black pepper to taste, a little knob of butter and a splash of cream, plus a spoonful of the asparagus cooking water. 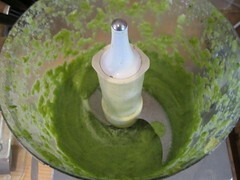 Whizz it up so you get this lovely pale green paste. Right. 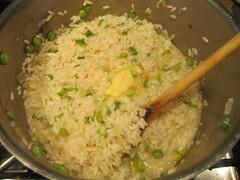 Put all the asparagus stuff to one side and get on with making your risotto, according to however you make yours. (Essentially a chopped onion or shallot, sweated slowly. 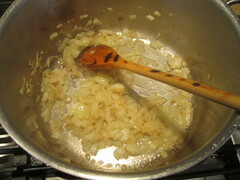 When the onion has softened, add the rice and a very generous splash of white wine or vermouth. 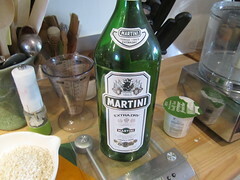 Cook down the booze and then add a ladle of vegetable stock (use what is left of the asparagus cooking water too) at a time, with more stock being added as the previous ladle gets absorbed. Stirring, stirring all the time so the rice doesn’t catch. It takes a while, but it’s so worth the effort. I recommend Radio 4 or NPR in the background, with a glass of the wine you used for the risotto in one hand and your wooden spoon in the other. 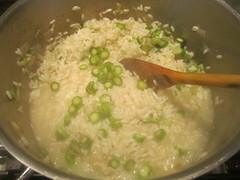 I add the little asparagus rounds about five minutes before the risotto is ready. Just before I serve it. I stir in the asparagus paste. Then I beat in a large knob of fridge-cold butter and a large handful of finely grated parmesan. Check the seasoning. It’ll probably need lots more salt and black pepper. 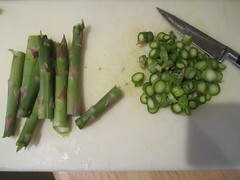 Garnish each plate with the reserved asparagus tips. EAT. *Drools*. I am not on a liquid diet and the recipe makes me drool. 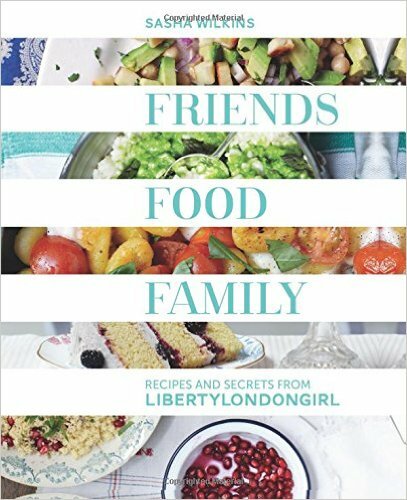 LOVE your recipe posts! 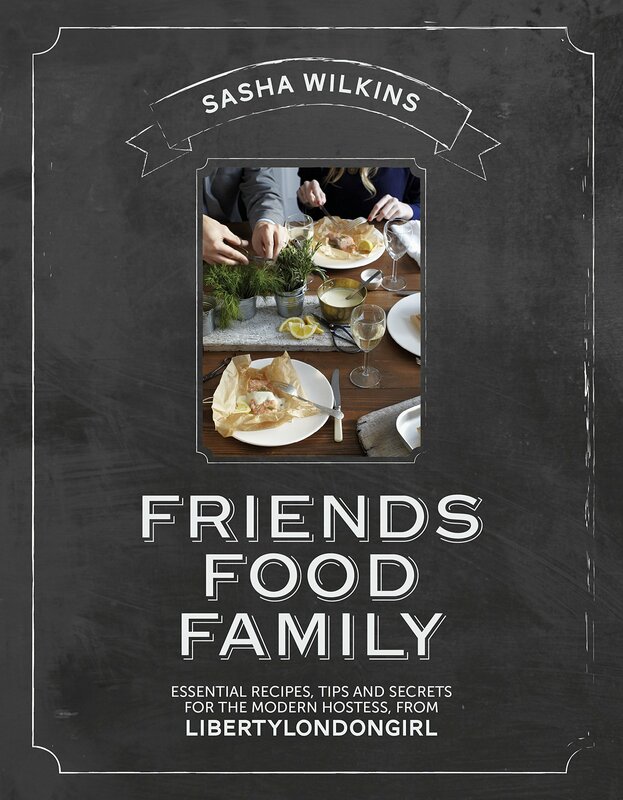 Wow, the asparagus cream grabbed my attention, sounds delish!